Sylvain Cournoyer, captain of the ferry "NM Lucien-L."
Here we are in the Port of Sorel, ferrying cars and trucks between Sorel-Tracy and Saint-Ignace-de-Loyola. 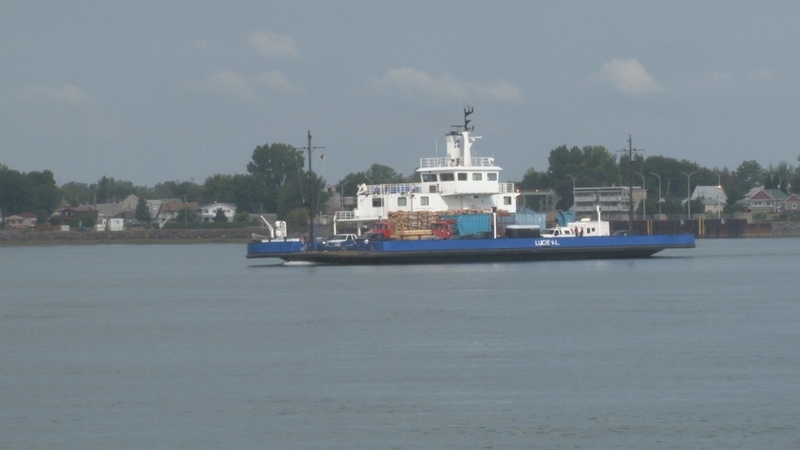 This ferry is the "Lucien L." It was built in 1967 in the Marine Industries shipyard. To pilot a boat like this one, you have to take navigation courses. You have to know cartography, and you have to know the Collision Regulations, which are like the rules of the road. It's like knowing how to drive a car, and road safety rules. It's the same thing; this is what we do on the water to avoid accidents and collisions. Several months ago, they also started to require knowledge of vessel stability. You have to know how much weight you can put on board, how the vessel will react, how much deeper will the vessel be submerged depending on the weight it is carrying. I've been working here for 12 years. I started as a mate, like my colleague, Stéphane. After a few years, I obtained my masters certificate and they asked me to work as a substitute captain. Since 2005, I have been working as a captain year-round, as I have accumulated enough seniority. There are two paths to arrive at my position. You can go to CEGEP and follow a regular educational path. There's a maritime training program offered at the CEGEP in Rimouski. But since I already had a college diploma, I didn't attend the CEGEP in Rimouski. I obtained my certificate via a continuing education program. I went to a school in Quebec City to study the Collision Regulations. Then after that, I took the other two courses, on stability and cartography at André-Laurendeau CEGEP in Lasalle. At that time, the Institut maritime du Québec had a school in Lasalle. That program doesn't exist anymore, it's only available at the CEGEP in Rimouski or through the private sector. If you know someone who wants to learn to be a captain, well, when the Société des traversiers wants to train a new officer, they call on me. I take on the role of professor. Another thing that's very important is understanding your instruments. You can take a course on navigating in reduced visibility, navigating by your instruments. This morning, for example, it was a three-hour crossing and you couldn't even see the foremast. That's why you need to know your instruments. I took an 8-week course in Quebec City, with radar simulators. They had me do a simulation; it lasted for a morning. People from Transport Canada examine you and award you the navigation instruments certification that attests that you can navigate in reduced visibility. When I received my certificate in 1994, I was allowed to be a mate on any vessel, anywhere in the world. I could work on a 300,000 tonne vessel, and I could take it all the way to Australia or South America. If you take a limited radar certification course, you have to stay in more sheltered sectors, in sheltered waters like those in this area, in Sorel-Tracy/Saint-Ignace. We are close to shore. I've been working here for 12 years, and I've never missed a crossing because of ice. But often, when ice conditions are severe, we can end up far behind schedule because we have an issue in Sorel-Tracy/-Saint-Ignace: when you arrive at Lanctôt Basin in Sorel, because it's a basin, you can't move the ice where you want it to go when the basin is covered in ice. If the wind is coming from the north, ice flows down the river and into Lanctôt Basin in Sorel-Tracy, and once it's in the basin it doesn't flow back out. Eventually, the ice becomes so dense and there's so much of it that it can't be moved. It really slows down the ferries because you have to go back and forth with your motors and slowly create a little passage to reach the wharf. Of course safety is our priority. The vessel has to be firmly attached and the walkway must be properly deployed before you let people disembark. I am certified, and so is my colleague. We're navigation officers, and we were trained to conduct a vessel. There's also an officer in the engine room, but he's an engineering officer. He also attended the continuing education program in Rimouski. But instead of learning navigation, he learned engineering. He knows everything aboard the vessel: electricity, hydraulics, pneumatics, structural elements, pumps—they hold no secrets for him. We bring the vessel up to the wharf, but it's the engineer who propels it and allows us to dock. We couldn't do without him. But someone has to be the leader. You can't have two leaders. That's why the captain is in charge.